Likely our College’s most storied tradition, the Purdue Ag Alumni Fish Fry was held last weekend in the Marsh Blue Ribbon Pavilion at the Indiana State Fairgrounds in Indianapolis. Most of the state had reasonable weather (as opposed to the last two years when we were buried in snow), and more than 1700 alumni, friends, supporters, faculty, staff, and students joined us for the event. While the Indiana State Fair grounds were a bit busier than normal due to all the Super Bowl events being held there, it was a great celebration of our College and the work each of you do every day. I am always humbled by the crowd that gathers for the Fish Fry – getting 1700 people to invest most of a Saturday for an event that evolved from the earliest meetings of Agriculture alumni somewhere around 1901 is pretty remarkable. Some may come for the Ag Forecast – our traditional opening discussion on a topic of interest to the industry and state.This year, Distinguished Professor of Agricultural Economics Mike Boehlje moderated a panel addressing the Future of Farm Legislation in U.S. Agriculture. Dr. Roman Keeney, Department of Agricultural Economics; Don Villwock, President of Indiana Farm Bureau; Mark Legan, Indiana pork producer and National Pork Producers Council Board of Directors member; and Rick Tolman, CEO of the National Corn Growers Association engaged in a spirited discussion about the future policy environment of the industry. Some probably come for the keynote speaker – this year Mr. Howard Buffett, president of the Howard G. Buffett Foundation, philanthropist, photographer, author, and Illinois farmer. (Yes, he is the son of Warren Buffett and his designated successor at Berkshire Hathaway.) Mr. Buffett truly connected with the crowd as he wove a story of how he became engaged in agriculture, conservation, domestic and global hunger, and our responsibility to take action to help provide adequate nutrition for those who are without it, both in our country and abroad. Some likely come to engage with our many faculty, staff, and students who staff booths and exhibits showcasing some of the work we do as a College. I am deeply appreciative of all who staffed these exhibits – it is a great venue to help our stakeholders understand what is happening in the College. Thank you! Some surely come to fellowship with fellow alumni, to host customers, and to connect with old friends. Maybe a few actually come for the fish and the pork (both donated by the Indiana Soybean Alliance and the Indiana Corn Marketing Council)! In the end, I am not sure any of these elements alone is enough to draw 1700 out to the Indiana State Fair Grounds in early February. I think underneath all this is a strong belief in the Purdue College of Agriculture, pride in a tradition we have established of making a difference in the state and society more broadly, and a desire to stay connected to and engaged in what we do. For me, the Fish Fry audience is both a statement of support and a challenge to build on our tradition and to continue to deliver students prepared to make a difference; research with purpose that drives discovery with impact, and engagement and Extension that transforms lives and livelihoods. If you ever needed evidence that what you do makes a difference, it was there last Saturday morning in Indianapolis. I want to extend a huge thanks to Danica Kirkpatrick, our Engagement Program Manager, who did an outstanding job of planning and executing the event – her first time through and she was terrific! Donya Lester, Executive Secretary of the Purdue Agriculture Alumni Association and Debby Jakes; our Advancement team: Eric Putman, Kyle Bymaster, Joel Hartman, Tammy Kettler, and Megan Madia; and Dinah McClure and Debbie Claeys all managed key elements of the day. I thank everyone who staffed our exhibits and, of course, the more than 200 volunteers who served the meal deserve a huge thanks! I know I am missing so many who played a role in the success of the 2012 Fish Fry with this acknowledgement, but please know your service is much appreciated. Sylvie Brouder as the Wickersham Chair of Excellence in Agricultural Research. A professor in the agronomy department, she has been at Purdue since 1995. Brouder's research focuses on plant nutrition and agro-ecology. It has led to the development of nutrient management guides and technologies that decrease greenhouse gas emissions and improve water quality by helping to balance the amount of carbon and nitrogen in soil, plants, water and air. She has developed an upper-level course on plant mineral nutrition and has received both industry and federal funding for graduate education. The Center for Global Food Security at Purdue has hired a managing director and received grants totaling $10 million for work to improve crops in Africa and train the next generation of global food security experts. Gary Burniske, who had been director of Mercy Corps operations in Bogotá, Colombia, since 2006, will run daily operations of the center at Discovery Park. Burniske's appointment comes at a time when the center, established in 2011, will begin work on two major projects that have received significant funding and align with two of the center's core mission areas - research and education. Dev Niyogi, Associate Professor of Agronomy and Earth & Atmospheric Sciences, was featured in Purdue Today’s Purdue Profile recently, highlighting his duties as Indiana state climatologist. He coordinates the Indiana State Climate Office, which acts as the state’s official source for climate data. "Weather, climate in general, can be fascinating and often unpredictable," he says. For most of the past decade Carol Sikler, alumni relations/communications coordinator in ABE, has spent hours each month strapped to machines at the local Indiana Blood Center. She's been trying to pay back a debt -- slowly replacing the units of blood that were made available to her husband, Chuck, during two lengthy hospital visits before he died in 2003. Sikler recently surpassed the "break even" point, having racked up 143 units of either whole blood or platelet donation. Her frequent donations qualified her for the Indiana Blood Center contest offering a pair of tickets to Super Bowl XLVI to a donor who gave blood or blood products four or more times in a three-month period. But Sikler was as surprised as anyone when she found out that she'd be attending football's biggest event in Indianapolis. Farmland owners are in for more property tax increases at least into 2015, Purdue Extension agricultural economist Larry DeBoer says. In the Jan. 27 issue of his column "Capital Comments," DeBoer said the base rate for the assessment of an acre of farmland will jump from $1,290 in 2011 to $1,500 in 2012. He estimates the base rate will be about $2,030 per acre by 2015. The 2007 base rate was $880. Indiana farmland is assessed based on its use value rather than its market value - a practice not uncommon among other states. For example, farmland that borders commercial or residential development is not assessed based on selling price but rather only on the income it can earn from farming, DeBoer said. Whether it’s planning for Spring Fest, the Ag Alumni Fish Fry, Purdue Agriculture’s presence at the Indiana State Fair, or other events around the state, Danica Kirkpatrick is up to the challenge. Through her efforts, thousands of people from the campus, the community and the state learn about the wide variety of topics and opportunities that make up Agriculture. The Purdue University Agricultural Alumni Association recognized eight leaders in agriculture with its highest award, the Certificate of Distinction, for the recipients' exemplary and longstanding service to their profession and communities. The awards were presented on February 4 at the Ag Alumni Fish Fry. "Purdue Ag Alumni is honored to present such a distinguished group of professionals with our highest award, recognizing the many ways they have gone beyond the normal call of duty to perform their jobs and to serve others," said Donya Lester, the association's executive director. "These eight people represent the highest degree of achievement and commitment to our industry. Their leadership and their values of citizenship and service have transformed businesses, organizations and communities, and they are an inspiration to all of us who work in agriculture and natural resources." 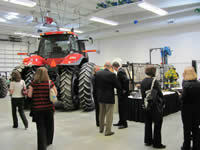 Agriculture faculty, staff and students are invited to meet and celebrate the 2012 Distinguished Agriculture Alumni on Friday, March 2. The college reception begins at 2:30 p.m., followed by the Distinguished Agriculture Alumni convocation at 3:30, both in the North Ballroom of the Purdue Memorial Union. John H. Lumkes, Agricultural and Biological Engineering, was presented with the Global Engineering Impact Award on January 20 by the Global Engineering Program of the College of Engineering. He was selected for the award for his work in helping Purdue students become future global problem solvers. George Patrick, Agricultural Economics, was recently honored by the Federal University of Vicosa (UFV), Brazil. Dr. Nilda de Fatima Ferreira Soares, UFV President, presented Dr. Patrick with a certificate “in recognition of, and gratitude for, his many contributions. For his encouragement, guidance and support towards the development and consolidation of the graduate program in Applied Economics.” Purdue University collaborated with UFV in strengthening undergraduate education in the 1950s and establishment of graduate education in agriculture, forestry and consumer economics. Marianne Bracke Stowell, Libraries, has received a Fellowship for Study in a Second Discipline from the Provost’s Office. She will use her fellowship in the Youth Development and Agricultural Education department. Charles Woloshuk, Botany and Plant Pathology, has received a Fellowship for Study in a Second Discipline from the Provost’s Office. He will use his fellowship in the Animal Sciences department. Amanda Emery, a senior majoring in Animal Sciences (pre-veterinary medicine) from Springport, Indiana, is featured as one of “5 Students who are Example Makers.” Amanda’s enthusiasm for agriculture is contagious. As a small group leader for Introduction to Animal Sciences and founding member of the ANSC mentor program, she helps fellow students tackle issues related to both their academic studies and personal life. Her campus advocacy will bear fruit this spring as Purdue hosts its first Agriculture Week. Defining experiences during service learning trips to Haiti and Romania have cemented her desire to pursue a degree in veterinary medicine after she graduates. Purdue opened the ADM Agricultural Innovation Center on January 18, heralding it as offering greater laboratory and classroom opportunities for students in the top-rated Department of Agricultural and Biological Engineering. The $4.2 million, 27,000-square-foot center was built with a $1.5 million contribution from Archer Daniels Midland Co. in 2011. ADM is a longstanding partner with Purdue in the education of agricultural and biological engineering and agricultural systems management students. Construction of the steel-frame building on the south side of campus began last spring. Honeybee populations have been in serious decline for years, and Purdue Entomology scientists may have identified one of the factors that cause bee deaths around agricultural fields. Analyses of bees found dead in and around hives from several apiaries over two years in Indiana showed the presence of neonicotinoid insecticides, which are commonly used to coat corn and soybean seeds before planting. The research showed that those insecticides were present at high concentrations in waste talc that is exhausted from farm machinery during planting. Christian Krupke, Entomology, was a co-author of the findings, which were published in the journal PLoS One in January. Greenhouse bedding plant growers can save themselves time, money or possibly both by giving cuttings in propagation more light, according to a Purdue University study. Flower growers use cuttings from Central America and Africa to start spring bedding plants in greenhouses during winter and early spring. Those cloudy days and cool temperatures make propagation time- and energy-intensive. Roberto Lopez, Horticulture and Landscape Architecture, and horticulture graduate students Chris Currey and Veronica Hutchinson study ways to minimize inputs and production costs in the floriculture industry while improving product quality. Based on what they were hearing from growers, they realized that light wasn't getting the attention it needed from the industry. A series of studies led by Bill Johnson, Extension weed scientist and professor of botany and plant pathology, has shown that spray water pH and hardness can reduce the effectiveness of herbicides, making it vitally important for crop producers to test water sources. Hard water or water with pH values as low as 4 or as high as 9 have been shown to lower the efficacy of herbicides, including glyphosate, nicosulfuron and saflufenacil. An ideal pH value would be 6-7. "At this point, it seems to be specific to a limited number of compounds," Johnson said. "It's amazing how little we know about this topic, considering the number of acres of crops planted in Indiana each year." Purdue researchers are discovering the next generation of insecticides directed at disease-carrying insects like mosquitoes, ticks and tsetse flies, which could help professionals in the human health, veterinary and crop production sectors. Catherine A. Hill, Entomology, and Val J. Watts, Medicinal Chemistry and Molecular Pharmacology, say vector insects - which carry and transmit infectious pathogens or parasites to other living organisms - are developing resistance to insecticides sprayed in the air or embedded in bed nets. The increased resistance makes insecticides less effective. New federal clean air regulations are projected to raise Indiana electricity rates about 14 percent by 2020 because of needed upgrades to coal-fired power plants, according to an analysis prepared for the Indiana Utility Regulatory Commission. "Due to the federal regulatory focus on emissions from coal-fired generators, Indiana is expected to experience larger price increases than projected on a regional or national level," said Douglas Gotham, director of the State Utility Forecasting Group, a state-funded panel of researchers based at Purdue University. The report was prepared by Gotham; Paul Preckel, Agricultural Economics; and analysts Marco Velastegui, David Nderitu and Tim Phillips. A recently formed task force is looking to help usher Purdue's tenure and promotion policy into the 21st century. In the first comprehensive review of the policy since the 1970s, the Provost's Task Force on Promotion and Tenure is examining how the policy may best be updated to reflect the increasingly complex nature and scope of university faculty work. The task force's goal, according to the Provost's Office, is to recommend by April 1 a draft of suggested modifications to the current policies and practices. The Office of the Provost is requesting applications for Purdue's Community of Service-Learning Faculty Fellows Grant program. This grant is designed for faculty members who have demonstrated a strong commitment to and desire to play a leadership role in service-learning. Up to five faculty members will be chosen for this round of grants. Each grant will be $5,000. Grant recipients will work alongside the campus Service Engagement Advisory Board and the Center for Instructional Excellence. The recent upgrade of all University Banner hardware is saving time for staff who run end-of-semester processes — such as grade reporting and academic transcript updates — and for students needing transcripts and financial aid. Banner is the enterprise software Purdue uses to process and maintain student academic and financial data. As a result of the recent hardware upgrade, employees in the Office of the Registrar were able to complete end-of-term processes more quickly at the end of fall semester 2011, says Cheryl Arroyo, associate registrar. For example, two end-of-term jobs — rolling grades into academic history and updating term GPA — that previously took about six hours to complete were finished in three hours on the new hardware. An upcoming public input session regarding Purdue's Comprehensive Energy Master Plan (CEMP) is one of several ways those interested are encouraged to provide feedback on the plan. The public meeting will be held from 7 to 8 p.m. Wednesday (Feb. 15) in Stewart Center, Room 310. Those wishing to comment on the plan at the meeting must preregister by noon Tuesday (Feb. 14) by contacting Debbie Johnson at 765-494-2306 from 7:30 a.m. to 4 p.m. on weekdays. Comments will be limited to three minutes per person. Presented to the Board of Trustees' Physical Facilities Committee in January, the energy master plan is available for review at www.purdue.edu/ees/cemp.